"Kong Barrel" redirects here. For information about a type of barrel from Donkey Kong 64, see Cranky's Kong Barrel. DK Barrels (sometimes called Buddy Barrels or Kong Barrels) are a type of Barrel that can be found in just about every level of the Donkey Kong Country and Donkey Kong Land series. If a Kong is traveling with his or her partner and is hit by an enemy or an obstacle, the ape will run away and the partner will become playable. If a Kong is hit when traveling alone, the heroes will lose an extra life. Fortunately, the lone Kong can break open a DK Barrel to reunite with their lost partner. Presumably, the Kongs that run away are captured and stuffed into these barrels by the Kremling Krew (as Diddy Kong was explicitly sealed in a DK Barrel in the game Donkey Kong Country). 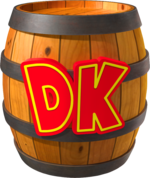 The DK Barrel can be identified by the red and yellow letters "DK" painted on its side, which is Donkey Kong's symbol. If a DK Barrel is on the ground, the barrel can be picked up and thrown like a normal Barrel (although it will break upon impact with the ground, instead of rolling across it). As such, a DK Barrel on the ground can be used as a weapon to destroy enemies. However, if the barrel is located in mid-air, the DK Barrel will simply break when touched by a lone Kong, releasing the lost partner. From Donkey Kong Country 2: Diddy's Kong Quest and on, if both partners are in play, the DK Barrel cannot be broken – it simply stays in mid-air until needed. Most DK Barrels in Donkey Kong Country 2: Diddy's Kong Quest and Donkey Kong Country 3: Dixie Kong's Double Trouble! are found in mid-air, and cannot be used as weapons; in Donkey Kong Land 2 and Donkey Kong Land III, all DK Barrels are found in mid-air. DK Barrels that are found in treasure chests can be picked up like normal Barrels – these appear in Donkey Kong Country 2: Diddy's Kong Quest. Additionally, there is a cheat in Donkey Kong Country 2: Diddy's Kong Quest and Donkey Kong Country 3: Dixie Kong's Double Trouble! that causes all DK Barrels and Star Barrels to deactivate. When the DK Barrels are disabled, a level is started automatically with two Kongs. In Donkey Kong 64, DK Barrels were replaced by Tag Barrels. DK Barrels returned in the game DK: Jungle Climber. DK Barrels return in Donkey Kong Country Returns where they have the same functions as before. In this game, they are always found on the ground and can be thrown. If Diddy is present when a DK Barrel is tossed, the barrel instead restores Donkey Kong's health if it is not full. DK Barrels return in Donkey Kong Country: Tropical Freeze, functioning just like they did in Donkey Kong Country Returns. With the addition of Dixie Kong and Cranky Kong, the barrels come in four new variations — a Diddy Kong Barrel marked with a blue "DD" instead of the usual red "DK", a Dixie Kong Barrel marked with a pink "DX" (this one containing Dixie Kong), a Cranky Kong Barrel with a yellow "CK", and another one which contains all three spinning in a roulette-like manner. With the latter barrel, Donkey Kong is able to choose his partner, by picking it up at the moment the wanted character's insignia appears (or by corkscrewing into it, if it is underwater). Normal DK Barrels only appear in Hard Mode; since the player only has one heart in their health counter and is not allowed partners during this mode, the DK Barrel is only useful as a weapon. In the Nintendo Switch port of Donkey Kong Country: Tropical Freeze, a fifth variety of a DK Barrel appears due to Funky Kong appearing as a playable character. Funky Kong's barrel is marked with a purple "FK". In Mario Party 8, when a character steps on a DK Space (or reaches a cannon in DK's Treetop Temple), Donkey Kong will appear before them by bursting out of a DK Barrel. In Mario Kart 7, DK Barrels appear on the jungle section of DK Jungle, where they are located on the sides of the track. They contain Bananas and Stars that are revealed by destroying the barrels with Green Shells, or by colliding with them at a high speed. A DK Barrel appears in Donkey Kong's Double Bogey animation in Mario Golf: World Tour and Mario Sports Superstars. With the return of DK Jungle in Mario Kart 8 and Mario Kart 8 Deluxe, DK Barrels also come back in the jungle section of the course. In the Super Smash Bros. series, Donkey Kong and Diddy Kong enter stages by bursting out of DK Barrels. One also appears as a Sticker in Super Smash Bros. Brawl and as a trophy in Super Smash Bros. for Nintendo 3DS / Wii U. One of the collectables Kirby can find in Kirby Super Star's Great Cave Offensive is the "Kong's Barrel". It is found in a room guarded by two Gordo in the Garden Area. The Kong's Barrel is worth 1,500 Gold. A DK Barrel is a token piece that can be used in Nintendo Monopoly. DK Barrels can be found floating in the ocean during the level Do U Stack Up? in Mario + Rabbids Kingdom Battle. Wii Donkey Kong Country Returns (11/2010) Little known fact: the "DK" on a DK Barrel stands for "Donkey Kong"... What? You mean you already knew that? In that case, you must also know that hopeful feeling you get upon seeing one of these in a really tough stage. Break one to release a helpful partner! Did you know that the "DK" on a DK Barrel stands for "Donkey Kong"?... You did? Well then, maybe you also know what a beautiful and hopeful feeling it is to see one of these when you're toughing it out alone, all sad and forlorn. Break it and a partner will show up to lift you out of your doldrums and help you on your way. ↑ Donkey Kong Country instruction booklet, page 17. ↑ Donkey Kong Country Game Boy Color instruction booklet, page 11. This page was last edited on April 6, 2019, at 14:15.